These are just some of the many unusual pieces I have. Contact me for more. Italian Marble, 71mm/2.79" x 51mm/2"
Used in art and architecture of ancient Rome this marble comes from quarries nearby which have provided the raw material for thousands of years. This is a hybrid ball/T-handle shape. Feels very ergonomic in the hand. Sealife Fossil, 52mm/2" x 64mm/2 1/2"
A great, warm color to go with any interior. It has the rich look of wood but with millions of years of history. 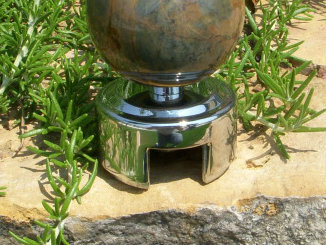 This knob has an upright, elongated shape that would work great in either an upscale, plush setting or a street rod. 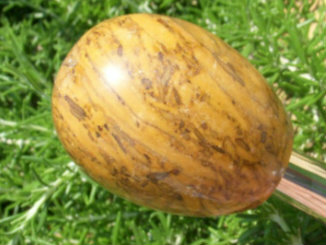 Crazylace Agate, 2" x 3 1/4" - Jumbo! 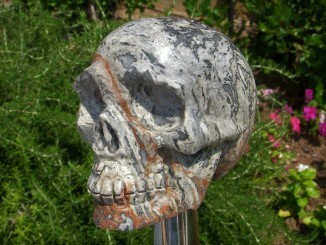 Hand carved and realistic, this skull is a testament to the skills of the artisan. The camera has a hard time picking up the detail of the natural veining of the stone. Neutral shades of gray with rust accents will go with any interior. 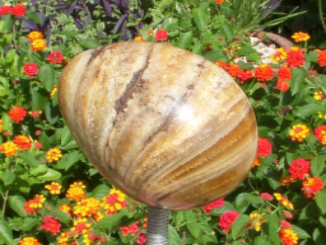 Dragon Eye in Bronzite, 49mm/1.91"
The bronzite base stone has a subtle golden sheen in a pattern resembling reptile skin. 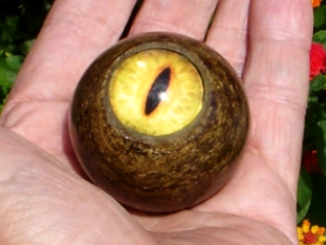 I have inlayed a glass eye to create a one of a kind shift knob. 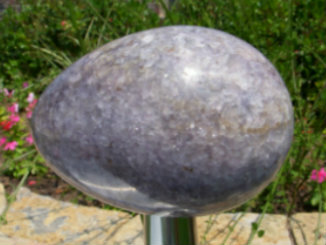 It has a smooth, round shape but the eye surface protrudes a lifelike fraction. If an alien were to lay an egg or a grub, this is exactly what it would look like. Install it sideways, T-handle style or straight, pointy end at the dash, your choice. Your shift lever must clear the dash by 2-1/2" or so. Mega jumbo size! 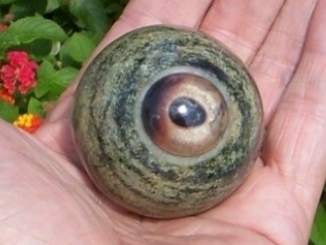 Jasper With Alien Eye, 53mm/2.07"
A taxidermy quality glass eye has been inset into the Jasper orb which has an erie, other worldly, skin like pattern. The eye bulges out a fraction higher to watch over your car for you. It make a humorous and totaly unique statement. 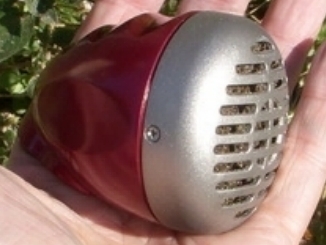 This harmonica style microphone shell is freshly refurbished in it's original colors. It no longer has working mic internals but is ready to go as a funky shift lever or possible tail light project. This chrome metal, pneumatic adapter allows you to install any gemstone shift knobs that I sell onto your 13/18 speed transmission shifter. 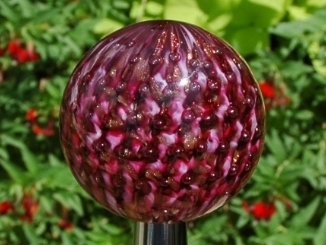 If you have an ol' school rig, you need an ol' school style shift knob to complete the look. 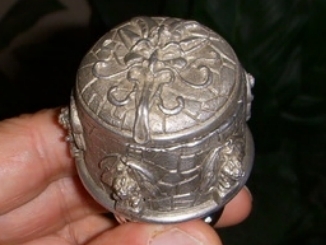 This is real deal pewter that has the maker's marks visible on the bottom. There are 5 gargoyles guarding the sides with the "King" gargoyle at the top. Repurposed by me into a one of a kind classy shift knob. Hand Made Glass Art, 57mm/2.25"
This work of art was created by a glass artisan and pieces like this are highly sought by collectors. Twisted ribbons of burgundy and copper with rows of precisely spaced, pearly bubbles make a lightshow that sparkles with fire. 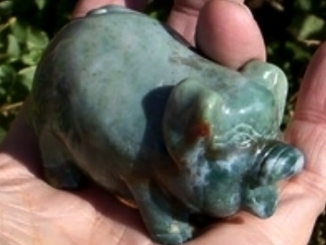 Indian Agate,1.59 x 1.79 x 3.01"
Hand carved in India, from a beautiful seamist, bluegreen gemstone, this little piggy is ready to go to market. It feels suprisingly smooth in hand and can be faced at the driver or away, as you like. I smile everytime I look at it. Now here's someting really over the top! At your next car show gathering, this can be the difference between taking home a trophy or taking home a hearty handshake and a "Thanks for coming". It's BIG and so will stand tall to require some space, but it's not so huge that it doesn't feel great in your hand. The glass globe is only 2 1/2" wide. 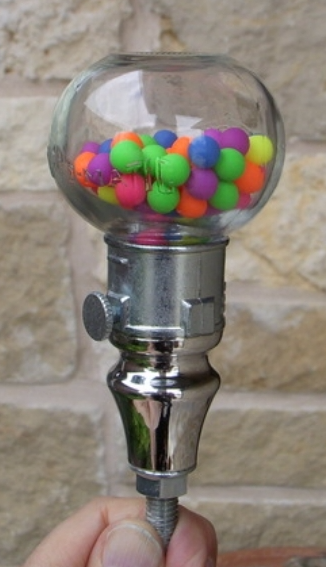 The "gumballs" are lose and do bounce around but because they are a special hard rubber, they won't make any noise so you can enjoy your ride in peace. The thread mount on this one will only fit a 3/8" x 16 shifter lever. It's an exception to my usual master inserts which are adaptable to fit every size.